Question: What is the difference between disabled Login and Deny Connect permission? This was one of the interesting question raised in MSDN forum. Since it was an interesting one, it qualifies for a blog. In Login Properties screen, under Status page there are two options for a login. What does that mean? Both would run different T-SQL but end effect is that user would not be able to connect. Why two “similar” options? 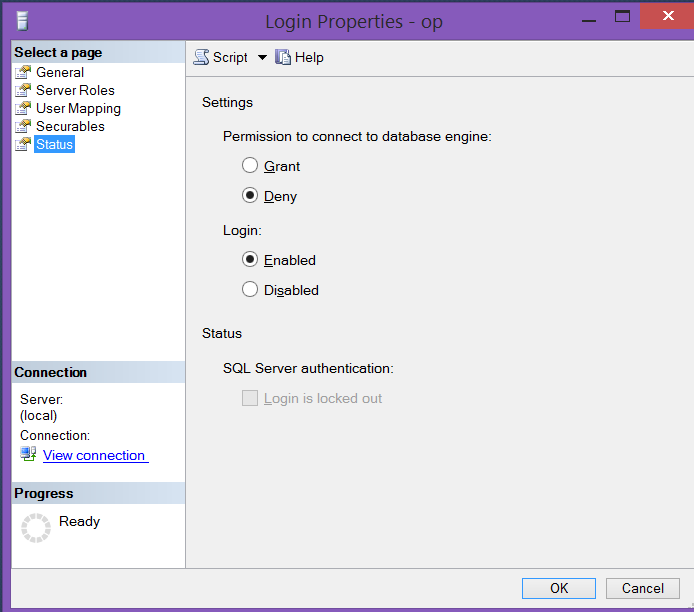 ALTER LOGIN [MyLogin] DISABLE will block the login from connecting to SQL Server. On the other hand, DENY CONNECT SQL will NOT block members of the sysadmin fixed server role from logging in because deny do NOT apply to sysadmins. Other use case is that disabled logins can be impersonated via execute as login = ‘login_name’ but they can’t directly connect. For disabled login below message. 2014-01-24 12:30:06.790 Logon Error: 18470, Severity: 14, State: 1. 2014-01-24 12:29:50.320 Logon Error: 18456, Severity: 14, State: 12. Hope you have learned something new. At least I did.